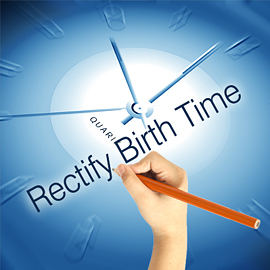 Find Your Birth Time (Rectification of Horoscope) is designed for those users who are uncertain of their exact time of birth. Vedic Astrology can be extremely precise when the birth time is known. But without it, the predictions may vary. Based on a number of questions regarding the major events in your life, as well as information regarding your family, a Vedic astrologer has methods to correct, or rectify, your birth chart and arrive at a time of birth that accurately reflects your life experiences.You can expect rectification of horoscope in about 15 - 20 working days.